When I lived in Paris and worked as a beautician, I was a trainer for a Swiss company that specializes in dermabrasion machines. I loved this non-invasive procedure that uses tiny crystals to help remove the superficial layer of dead skin cells. The machine works on the principle that when you remove the top layer of dead skin, the body treats it as an injury, and quickly replaces the lost skin cells with new healthy ones. The procedure—which takes 30 minutes— is safe but sometimes, uncomfortable, hurts a little, causes red face, and, if frequently used, the skin becomes too sensitive. When I heard that there is a peeling cream which has all the benefits of this machine of dermabrasion without the inconvenience, I started using it on my face and in each facial at my beauty center. This peeling cream is Exuviance Triple Microdermabrasion Face Polish. Why triple action? Because it has a unique blend of physical, chemical, and enzyme rejuvenators. The second one is a chemical, Glycolic Acid, to remove the top layer of dead cells from the face, revealing brighter and fresher skin. This Glycolic Acid will also treat skin discoloration and signs of aging like an even skin tone, fine lines and wrinkles, acne, black/white heads, dullness, oiliness —it’s a very powerful exfoliant. The 3rd action is Papaya Enzyme, which is a rich source of vitamin C, A, E, Magnesium and Potassium. The enzyme called Papain helps your skin-whitening, moisturizing dry skin, and repairing sensitive skin. This blend of “triple anti-aging action” will give you a glowing skin that each woman dreams of. A gorgeous silky softness for a brighter complexion with a reduced appearance of wrinkles, lines, skin tone, pores, dark spots, and dullness. Use once or twice a week; apply a thin layer to a clean wet face, lightly massage in a circular motion for 30 seconds—avoiding the eye area. Do not scrub, leave on for up to 2 minutes or up to 1 minute for sensitive skin. Rinse well with warm water and gently pat-dry. Follow with Exuviance Vespera Bionic Serum. This powerful serum restores youthful radiance, which dramatically diminishes visible signs of aging. It is blended with Alpha Hydroxy and Polyhydroxy Acids, vitamins A, C, and E, lactobionic and powerful antioxidants. This will improve even signs of photoaging, including lines and wrinkles, enlarged pores, loss of firmness, uneven pigment, dullness, and rough texture. It is an intensive serum that I used for years. I love it and advise you to use it, not only after this microdermabrasion peeling, but every night. Each woman likes to be complimented that she has a beautiful skin, this combination of peeling and night serum will make a big difference for your skin. 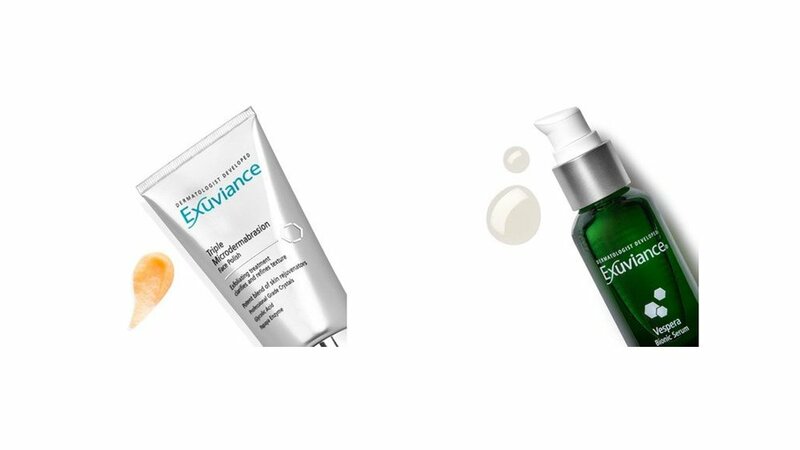 Exuviance Triple Microdermabrasion Face Polish is affordable and will last a minimum of 6 months. The Exuviance Vespera Bionic Serum is also affordable. If you use it after the peeling , it will last for a year. If you use it daily at night —which I recommend—it will last you 3 or 4 months. Glowing skin is a result of proper skin care. Beautiful skin requires commitment. If you give 5 minutes and less that $1 per day, you will look younger and healthier for many years. Invest a little of time and money in your skin, it is going to be with you for a long time. If you want to keep up with the latest beauty advice, visit my YouTube Channel and subscribe. Also, if you’d like to experience the best European facial you have ever had, visit my skin care clinic and book a session.